The late Hon. Mario Oriani-Ambrosini, Member of Parliament (MP) introduced the Medical Innovation Bill (hereafter the Bill), in September 2014. Hon. Oriani-Ambrosini (MP) was then diagnosed with terminal lung cancer and commenced a campaign to legalise the medical use of cannabis. The objectives of the Bill are to: legalise and regulate the use cannabinoids for medicinal purposes, commercial and industrial use of cannabis. Parliament’s Portfolio Committee on Health rejected the Bill on 22 November 2017. 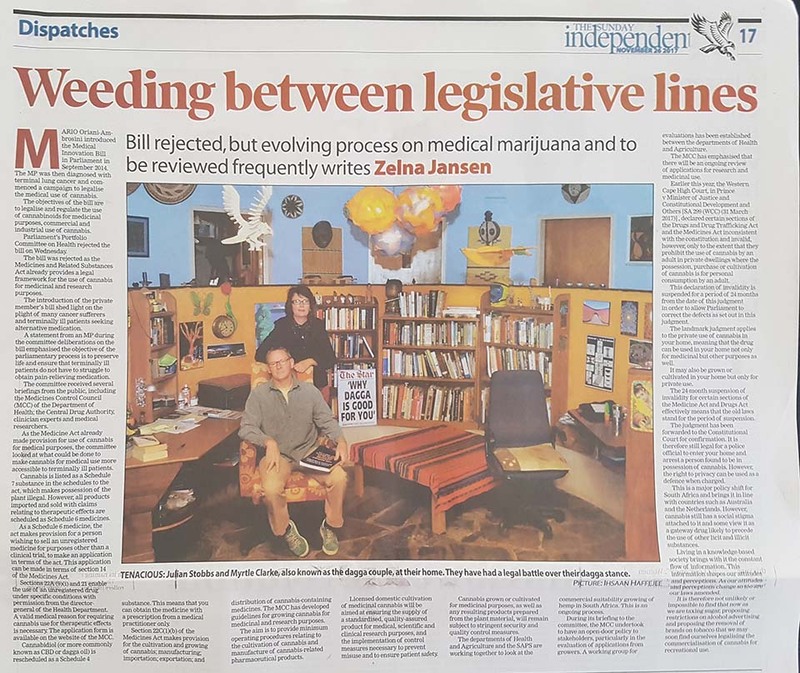 The Bill was rejected as the Medicines and Related Substances Act (hereafter Medicines Act) already provides a legal framework for the use of cannabis for medicinal and research purposes. The introduction of the private members bill shed light on the plight of many cancer sufferers and terminally ill patients seeking alternative medication. A statement from an MP during the committee deliberations on the Bill emphasised that the objective of the parliamentary process is to preserve life and ensure that terminally ill patients do not have to struggle to obtain pain relieving medication. The committee received several briefings from the public, including the Medicines Control Council (MCC) of the Department of Health; Central Drug Authority, clinician experts and medical researchers. As the Medicine Act already made provision for use of cannabis for medical purposes, the committee looked at what could be done to make cannabis for medical use more accessible to terminally ill patients. Cannabis is listed as a Schedule 7 substance in the schedules to the Medicine Act, which makes possession of the plant illegal. However, all products imported and sold with claims relating to therapeutic effects are scheduled as Schedule 6 medicines. As a Schedule 6 medicine, the Medicine Act makes provision for a person wishing to sell an unregistered medicine for purposes other than a clinical trial, to make an application in terms of the Medicine Act. This application can be made in terms of section 14 of the Medicines Act. Sections 22A (9)(i) and 21 enables the use of an unregistered drug under specific conditions with permission from the Director-General of the Department of Health. A valid medical reason for requiring the use of cannabis for therapeutic effects is necessary. The application form is available on the website of the MCC. Cannabidiol (or more commonly known as CBD or dagga oil), is rescheduled as a Schedule 4 substance. This means that you can obtain the medicine with a prescription from a medical practitioner only. Section 22C(1)(b) of the Medicine Act makes provision for the cultivation and growing of cannabis; manufacturing; importation; exportation and distribution of cannabis-containing medicines. The MCC has developed guidelines for growing cannabis for medicinal and research purposes. The aim of the guidelines is to provide for minimum operating procedures relating to the cultivation of cannabis and manufacture of cannabis-related pharmaceutical products. Licensed domestic cultivation of medicinal cannabis will be aimed at ensuring the supply of a standardized, quality-assured product for medical, scientific and clinical research purposes, and the implementation of control measures necessary to prevent misuse and to ensure patient safety. Cannabis grown or cultivated for medicinal purposes, as well as any resulting products prepared from the plant material, will remain subject to stringent security and quality control measures. The Departments of Health and Agriculture and the South African Police Services (SAPS) are working together to look at the commercial suitability growing of hemp in South Africa. This is an ongoing process. During its briefing to the committee, the MCC undertook to have an open-door policy to stakeholders, particularly in the evaluation of applications from growers. A working group has been established between the Departments of Health and Agriculture on the evaluations of applications. The MCC emphasised that there will be an ongoing review of applications for research and medicinal use. It is therefore an evolving process that will be reviewed frequently. Earlier this year, the Western Cape High court in Prince v Minister of Justice and Constitutional Development and Others [SA 299 (WCC) (31 March 2017)] (hereafter Prince case), declared certain sections of the Drugs and Drug Trafficking Act (hereafter Drugs Act) and the Medicine Act inconsistent with the Constitution and invalid, however, only to the extent that they prohibit the use of cannabis by an adult in private dwellings where the possession, purchase or cultivation of cannabis for personal consumption by an adult. This declaration of invalidity is suspended for a period of 24 months from the date of this judgment in order to allow Parliament to correct the defects as set out in this judgment. The landmark judgement applies to the private use of cannabis in your home. Meaning that the drug can be used in your home not only for medicinal but other purposes as well. It may also be grown or cultivated in your home but only for private use. The 24-month suspension of invalidity for certain sections of the Medicine Act and Drugs Act effectively means that the old laws stand for the period of suspension. The judgement has been forwarded to the Constitutional Court for confirmation. It is therefore still legal for a police official to enter your home and arrest a person found to be in possession of cannabis. However, the right to privacy can be used as a defence when charged. This is a major policy shift for South Africa and brings it line with countries such as Australia and the Netherlands. However, cannabis still has a social stigma attached to it and some view it as a gateway drug likely to precede the use of other licit and illicit substances. Living in a knowledge-based society brings with it the constant flow of information. This information shapes our attitudes and perceptions. As our attitudes and perceptions change so too are our laws amended. It is therefore not unlikely or impossible to find that now as we are taxing sugar, proposing restrictions on alcohol advertising and proposing the removal of brands on tobacco products that we may soon find ourselves legalising the commercialisation of cannabis for recreational use.